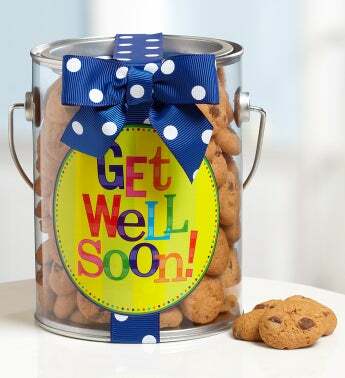 Make someone who feels under the weather smile, with our Get Well Soon! Chocolate Chip Cookies in a Can. It’s a resealable paint can filled with the tastiest mini-chocolate chip cookies they’ll ever eat, tied with a bright blue ribbon covered in white polka-dots!